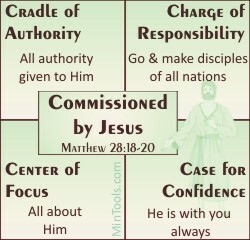 Jesus' words in Matthew 28:18-20 have come to be known as the Great Commission. As a church leader, part of your responsibility is to support and promote God's mission for the church. All believers should obey the Great Commission as nowhere do we read of it being solely a leader's or missionary's responsibility. The intent of this site, however, is to look at the Great Commission from a leadership perspective to learn some essentials about being a leader. Jesus said, "All authority in heaven and on earth has been given to me." Too often we exclude the eighteenth verse of Matthew 28 from a recitation of the Great Commission but these words are vital to a proper understanding of the church's mission. We go out in His power and authority, not our own. If church leaders don't get this issue of authority settled, they might hinder the Body from doing their part in fulfilling the Great Commission. Click below for how leadership tendencies could have this effect. After reading some thoughts on that answer, use your back button and continue on this page. Jesus exhorted His disciples to make disciples. Notice the qualifying factors. "Go and make disciples." - While you are going (whatever you do, wherever you go), make Christ-followers. ... Be proactive or intentional in this at all times. "Make disciples of all nations." - Think big when it comes to making disciples (all). ... Be outward focused, always looking at the big picture. How seriously you take this charge will be seen in how much you steer the church toward these qualifying factors. Click below on which, if any, of these attitudes fits how you feel about this charge and your leadership role. After reading some thoughts on that answer, use your back button and continue on this page. I don't see outreach as my primary responsibility. Other people are more qualified to make disciples. Evangelism is almost an obsession. Everything I do is about making disciples. People's identity needs to be found in God, not the leader or church. Their allegiance belongs to Him, not a person or organization. Anything we do to help people identify with Him needs to be done in His name, not in our name. People's ultimate accountability is to the Lord, to not only know what He commands but to do it ... obey everything. He is the standard, the source of authority ... what He commanded. A leader's goal should be to transfer any dependence off of themselves and onto the Lord. Click below on struggles you might have that tend to put the focus elsewhere. After reading some thoughts on that answer, use your back button and continue on this page. How easily insecurities can set in as we seek to reach out and disciple others. Leaders are not exempt from fear of failure, concerns about what people will think, and other uncertainties about the process. Fears and insecurities do not have to immobilize if we pay careful attention to the reason we can move forward with confidence to fulfill the Great Commission. -- Jesus said, "surely I am with you always, to the very end of the age." Click below on what tends to make you feel insecure. After reading some thoughts on that answer, use your back button and continue on this page. Hopefully you took time to click on your response to each question. Be sure to follow up on suggestions provided. For more input, take time to look at each response to benefit even further. Assessments - Great Commission: Encompassing or Complicated?